Stafford, VA. A suspect was arrested early Wednesday morning after a deputy with the Stafford County Sheriff’s Office found an unoccupied vehicle in a ditch and later located the driver at a nearby residence. On April 3, 2019, at approximately 1:21 a.m., Deputy McAlister observed a vehicle in a ditch near the intersection of Thomas Lane and Musselman Road. The deputy exited his vehicle and discovered the vehicle was running, but unoccupied. Additional units responded to the scene and they learned the registered owner of the vehicle lived at a nearby residence. 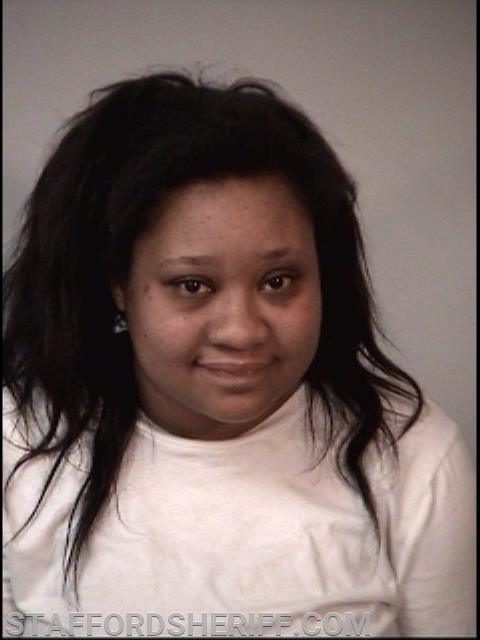 They responded to a residence located on the 900 block of Bellows Avenue and made contact with a female subject identified as Reese Juggins, 21, of Fredericksburg. When deputies made contact with Juggins, she was crying hysterically and appeared to be intoxicated. Her eyes were bloodshot and glassy, her speech slurred, and the odor of an alcoholic beverage was emanating from her person. Juggins said she was driving to a nearby motel when she crashed into the ditch. Another deputy had driven by the intersection of Thomas Lane and Musselman Road approximately 30 minutes beforehand and had not observed the suspect vehicle there. Deputies determined that the accident occurred sometime between 12:51 a.m. and 1:21 a.m. She also admitted to being intoxicated while driving the vehicle. Field sobriety tests were subsequently conducted and a preliminary breath test was administered. Juggins was taken into custody for driving under the influence. She was incarcerated at Rappahannock Regional Jail on a $1000 unsecured bond.